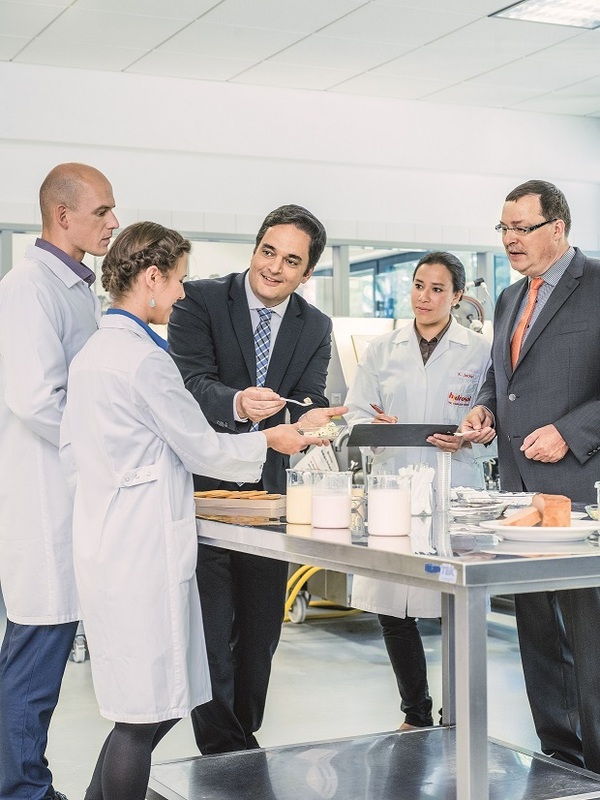 New ideas, new markets – a slogan under which Hydrosol develops and produces tailor-made stabiliser and texturing systems for dairy, meat, sausage and fish products, deli foods, ice cream and beverages. As Dr Moser explains, a nose for trends is the key to success: “We closely monitor food trends in the world’s markets and develop the perfect solutions to meet our customers’ individual needs.” For example, Hydrosol was one of the first suppliers to offer clean label solutions for dairy products, just over ten years ago. The company also addressed the high-protein trend with various concepts, followed by plant-based alternatives to meat and dairy products. The company now offers a wide range of solutions in this area, from various alternatives for milk products, cheese and ice cream, to vegan cold cuts and plant-based sausages for eating hot and cold, to all-in compounds for vegan burger patties and vegan nuggets, schnitzel, fish sticks and other breaded products.